The temperature may vary more on Mars, but the avatars are hot! Now you can win BLU for your fashion sense and style. We're going to offer BLU prizes to our top rated avatars, with 2000 BLU going to number one! Who can stop with just one, though? Positions 2-10 will win 1500 BLU, 11-31 win 1000 BLU and others in the top 50 will win 500. Voting ends May 1. How can you win more votes? Make yourself easy to find! Not only can you find avatars by checking top-rated, you can also get to the top of the 'Recents' list by buying new outfits and changing often. Make yourself more visible, literally, by adding a photo to your app profile. Invite your friends to download Blue Mars Mobile and ask them to vote for you! Go to "Help > Invite a Friend" to send them an invitation email. Don't forget! The polls close May 1. Good luck, look sharp, enjoy Blue Mars Mobile! 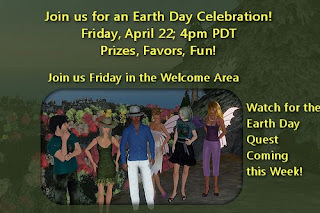 Celebrate Earth Day with Blue Mars! What connects us all? The planet we live on, for one! Let's get together to celebrate the beauty, life force, and conservation of Earth. 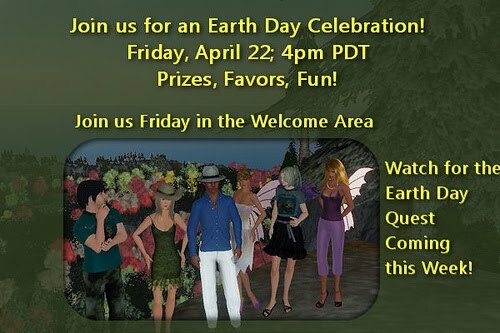 Earth Day is Friday, April 22, and we have a party planned in the Blue Mars welcome area dancefloor. We'll start with music, dancing, and party favors for all. DavyRocket has made some gifts for us including a beautiful Blue Earth pendant. The guys have a blue jay to wear on the shoulder, and the ladies will receive a teddy bear to hold. See all the prizes at this link. There will be opportunities to win BLU$, too. You can win by sharing an original poem about Earth or any Earth Day related topic or by sharing a great way to conserve the energy and resources of our planet. If 4pm PDT is a bit late for you, come by the Welcome Area early. The volunteers will be there to hear your poem or other Earth Day ideas, and you can pick up your free gifts. Move to the next station. Just keep going along the river while keeping the river to your right side. Complete all 15 stations to win our Earth Day shirt. We're all winners when we save the Mother Earth. Enjoy the celebration on her offspring Blue Mars! 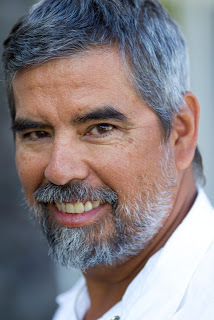 Henk Rogers, Co-Founder of Avatar Reality, will take on a more integral role with the day to day operations of the company as its new CEO, effective April 18, 2011. Rogers is widely respected with a proven track record of success. He is best known for revolutionizing the videogame industry by bringing Tetris to the United States and world market. His career began almost 30 years ago, when he programmed and self-published Japan's first role-playing game (RPG), The Black Onyx, which became the #1 title in the country. "I believe that the full potential of the Blue Mars platform and technology has yet to be realized," said Rogers. "With this, I am excited about the innovation to come, and am fully committed to the success of the company and Blue Mars." "We are thrilled that Henk will take on an expanded, more active role at Avatar Reality," said Co-Founder Kazuyuki Hashimoto, who will continue as President. "Our team, the product, and the Blue Mars community will all benefit from his vision, leadership and experience. With the recent success of Blue Mars Mobile, our first iOS application, and some new, breakthrough technology in the pipeline, this is an exciting time in the history of our company." Welcome, Henk! We're happy to have you. Onward and upward to Blue Mars! It's April, and it's Party Time! This Friday our party will be Spring Creatures of Mars! Join us as we celebrate the Wild Thing in us all this Friday, April 15 at 4pm PDT (7pm EDT, midnight GMT). Who attends? Any member of Blue Mars who would like to! Sometimes the staff drops by. The volunteers and the dancing bots are regulars. We congregate to welcome any new members or others who have questions or interest related to Blue Mars. This is a great time for those who found Blue Mars Mobile to take a peek into Blue Mars PC to explore that facet of the Blue Mars universe. Anyone who thinks Friday nights are meant for music, friendship, and fun are welcomed. This week, our contributing designers, DavyRocket and SMZ-Greenie, have promised some creature freebies. We're not exactly sure what they will make for us, but I've heard whispers about wings and curly horns as party favors for our guests. Best Creature Performance by an avatar! Music this week will be provided by 106themix. Be sure to request your favorite songs for the party playlist. Use their request line 20 minutes or so before the party starts. Choose your favorite tunes, or pick some with a creature theme! If 4pm PDT is a bit late for you, come to the Welcome Area in Blue Mars early to show us your creature costume or face paint. We'll be sure you get the party favors, too! If you are a Blue Mars Mobile user and you can't get into Blue Mars, show us your creature look on your BMM avatar! Message JosieBlues, so I can show everyone else the Martian Wild Thing in YOU by posting it on Flickr. See you Friday in Blue Mars! Yes, our major server upgrade is complete! But we have other recent innovations in Blue Mars and Blue Mars Mobile as well. With Blue Mars Mobile, you will now receive an email whenever anyone places a comment on your profile. With one click, you can open the BMM, and see the new feedback. 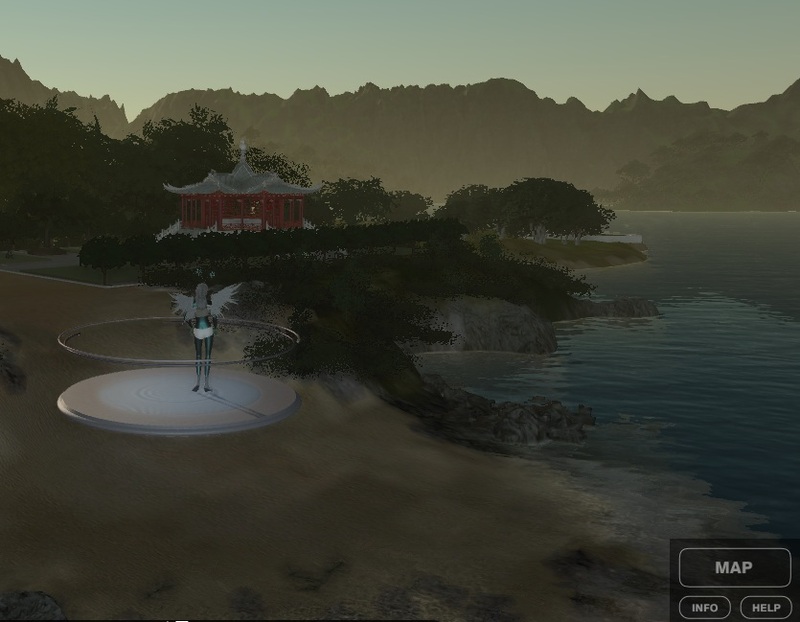 Several Blue Mars cities have had recent updates, too! Vist IDIA Labs to see a new user hud interface for information and easy navigation from place to place. Have fun in Blue Mars! Blue Mars servers will be offline this week for a major migration. It will take all day, and unfortunately most of Blue Mars--including the PC client and the iOS-- will be down during that time. Starting Wednesday, we will post periodic in-world and in-app announcements about the shutdown. We apologize for the inconvenience this may cause, and we ask for your patience and cooperation as we work to get everything back online as soon as possible. Latest Version of Blue Mars Mobile Now Available on the App Store - New Chat Feature! Blue Mars Mobile (v 1.3) is now live and features more social tools and stronger integration between the iOS and PC Clients. The new Chat functionality allows users to connect with anyone in the Blue Mars universe, whether they are online in the App or PC/Windows version. Simply add people to your Friends list, and once they approve your request, you can start chatting. If you are a PC Client user and already have an established Friends list, it will automatically appear in the App. Download or Upgrade Blue Mars Mobile on the App Store. Please help us spread the word about Blue Mars Mobile. Once your friend creates an account, we'll send both of you a reward! See the Help section in Blue Mars Mobile for details or find out more in our Wiki Guidebook.